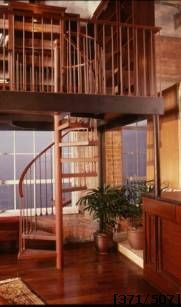 This 60" diameter stairway has 30 degree treads and a circular landing. The handrail is a # 242 (2") round oak. The main balusters are # 303 (5/8") square steel bar, with center balusters # 335 (5/8") square steel bar. The balusters are spaced 6" on center and each baluster has a 5/8" square bronze shoe. The treads are a # 120 (12 gauge) pan type steel and the wood overlay is # 140 (1") oak. The center column is a heavy duty 3 1/2" round steel schedule 40 pipe. The metal is finished with standard black paint with the wood components being finished by owner.